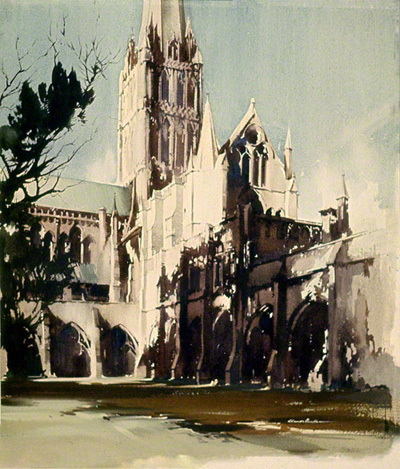 This is one of a number of water colour paintings that Claude Buckle did as a commission for the railways and also privately. The picture brings the strong architectural lines of Salisbury Cathedral into focus. The picture shows the Cathedral from within the cloister. The cathedral has the largest cloister and the largest cathedral close in Britain. 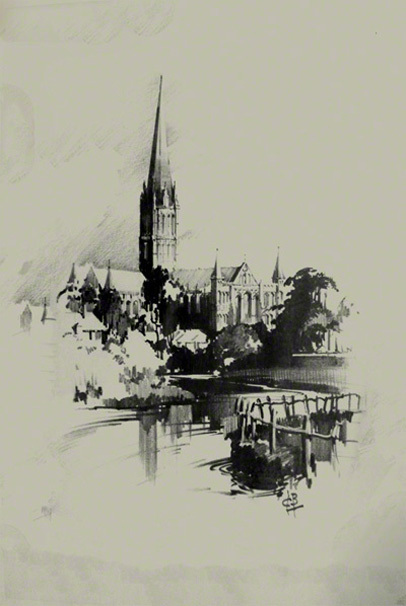 Pencil drawing of Salisbury Cathedral with the River Avon in the foreground. Almost certainly a railway poster proposal. The poster, Salisbury 'where history lingers' may have been the final result.